The California Grill located at Disney’s Contemporary Resort is well known for serving delicious flavors of the Pacific Coast while offering guests a fantastic view of Magic Kingdom’s nighttime fireworks. The special dining event held in their private Sonoma Room and Napa Room, Celebration at the Top, has been extended to include select Sundays through December 24, 2017. Light bites and refreshments are served for one hour prior to the Magic Kingdom fireworks. 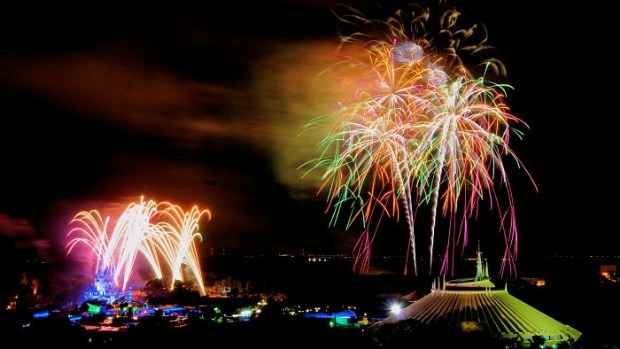 As the time for the fireworks show approaches, guests can step out onto the private observation deck reserved just for Celebration at the Top guests to enjoy an incredible view of the Happily Ever After spectacular. The lights will dim and music is piped into California Grill. After the fireworks, head back inside to enjoy a sweet spread of petit four desserts, cordials, and coffee. Complimentary valet parking is included with this event. The price is $99 plus gratuity and tax per person and reservations can be made online or by calling (407) WDW-DINE. Visit our Walt Disney World Events page to see the complete list of all events happening at Walt Disney World!